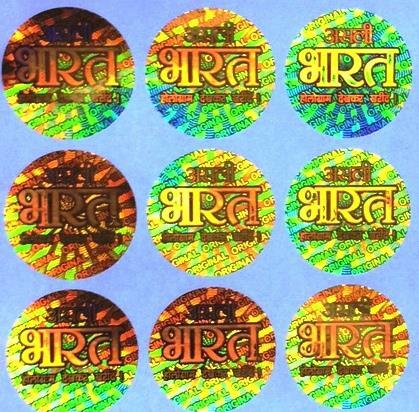 Hologram Sticker Supplier,Holographic Paper Label Exporters in India Welcome to Kiranholographics at Jaipur in Rajasthan is one of the leading manufacturer & exporter in India and into trading of high-quality Holograms and all holographic security solutions. 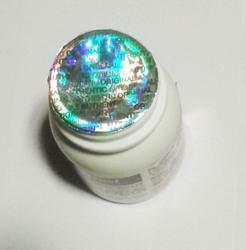 Void Hologram label is an tamper proof Hologram sticker which contains client specifications or registered hologram image when apply to any product surface. If end user tamper the Hologram “VOID VOID” mark remains on image. 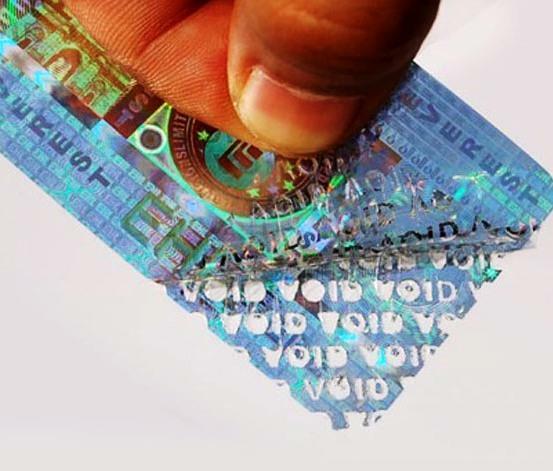 Kiranholographics provide an additional security to fight against counterfeiting of genuine products.User will unable to reapply it , The sticker shows :VOID” Indicating the seal of security is already broken. 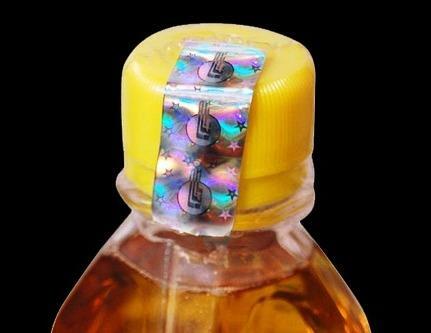 In this pressure Tamper evident Holographic label Honey comb pattern can also be produce by us. 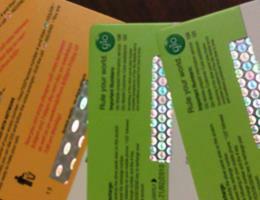 Scratch Holographic Labels are use to hide Pre-printed Information on cards or security documents. 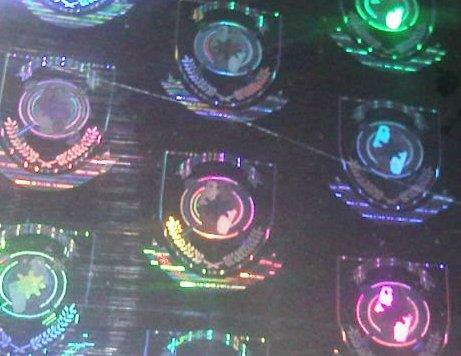 It is basically use to promote business in the form of giving gifts.these holograms are designed using high quality materials and print techniques. 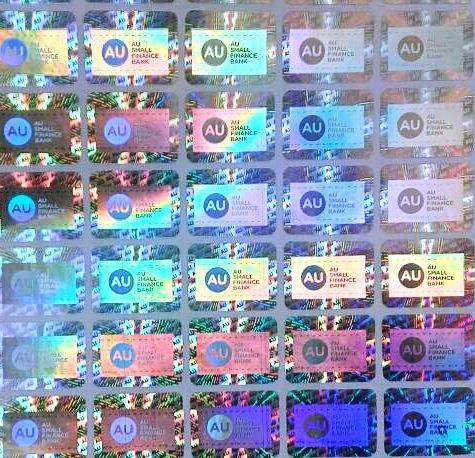 This hologram helps out in maintaining the data electronically by varying the spacing and width of parallel lines.These are versatile in nature and easily find them on lot of products ( Pin code on mobile recharge cards) we are exporter of Hologram stickers worldwide. Kind of Hologram Master Plates : How we Do Hologram Image Origination: The core scientific Principle being that Beams of Light can be split up and when passes through lenses at different angles produces an interference Pattern which got registered as image on glass plate . Hologram master Origination is a Piece of Nickel mold which plays security key in hologram manufacturing. Which helps in defending counterfeiting of fake products. Kiranholographics originate master plates from latest Technology machines such as --- Dot-matrix master Origination , Kinemax etc. We provide combination of different security features like Micro text,Nano Text, Guilloche Lines, CLR Image,Kinetic effects, Animated Concelaed laser readable text, Lens effects , Raster effect etc. 1)	2D/3D – Hologram Master Plate: 2D/3D Hologram master Image is developed by laser Optical recording in which two interference beams intersect together and form colouful image with 3D depth. 2)	Dot-matrix Hologram Master Plate: Dot-matrix Hologram image origination allows unlimited computer control by using high tech designing softwares and laser beam tiny millions of grating dots at different viewing angles are accurately recorded results a high resolution hologram image very eye catching and reflecting white light at all angles. 3)	True Color Hologram: True Color Hologram Master Image id formed by Photographic quality Portrait or any image with black and white colors artwork. This is very Unique feature if counterfeiter cannot get original portrait, they won’t be able to duplicate similar hologram close to original one. 4)	E-Beam Hologram : Exactly the e-beam technology of hologram origination is used in products as security applications. This technique is to provide high resolution for nano features and vivid and sharp images. By using E-beam hologram technique, we can also add color control and animated hidden text and images to make it more authentic. Our E-beam Holograms incorporate security elements that cannot be manufactured using other technologies. E-beam technology creates originals of computer-synthesized e-beam holograms with high level of protection parameters. 5)	Flip-Flop Hologram: In flip-Flop Master generates feature to display two or more images from different angles.The viewing angle changes Horizontally (left to Right) or vertically (upside and down) different images evolve through hologram label. 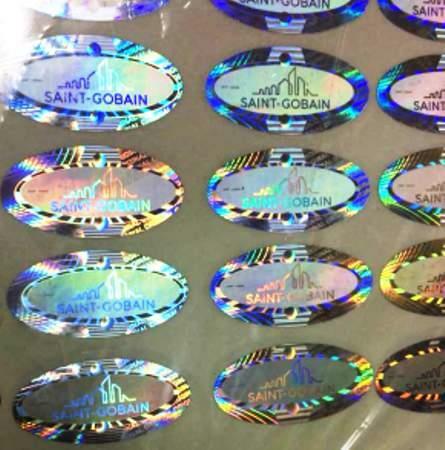 Kiranholographics suggest new feature to our customers to Track and Trace Holographic Stickers by two ways: INKJET SEQUENTIAL SERIAL NUMBERING & LASER ETCHING on Holograms Inkjet Serial Numbering & Laser serial numbering etching on hologram. Customers can provide any Alpha numeric Number series or random nos can be print by Thermal ribbon or etched by laser. This is very easy way to track and trace security holograms with random serial nos. : Lithogram is a very high secure Security feature Developed by Lithography technology in which hologram is recorded through Laser beam upto resolution of 120000 DPI. The holographic Image cosists of a Spectrum of Colours, a Lithography area or an Image is absolutely colorless from all angles. Now holographers can give metallic effects. It is latest feature which is absolutely Impossible to counterfeit. 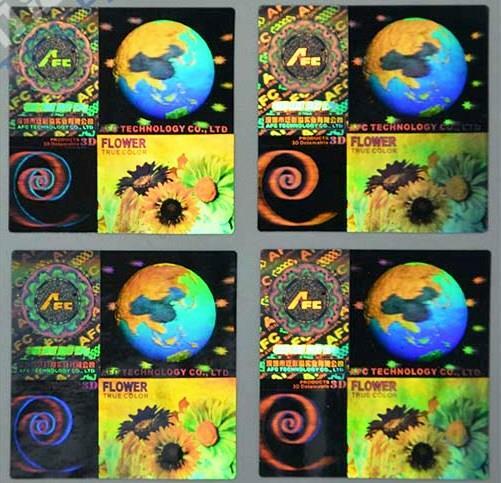 Kiranholographics can provide the security hologram and hologram security stickers with 'Thermo-chromic Ink' which respond to changes in Temperature by changing from 'colored to colorless' with a rise in Temperature and from 'colorless to colored' when the Temperature drops. 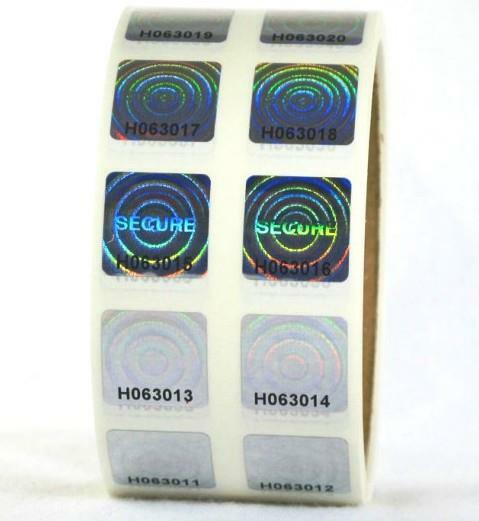 We can supply security hologram and hologram stickers with other security inks such as UV ink, fluorescent ink, Optical variable ink, IR security inks, Sun-light sensitive security ink, etc. 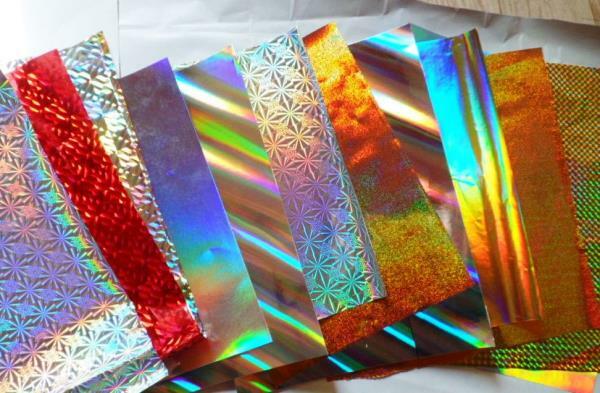 Hologram Hot-Stamping Foil -----Hot-Stamping Foil is basically a Mulitilayer PET films with high resolution holographic Pattern or registered Hologram Image with thickness of 15-25 micron Polyster coated with special wax release Layer. This can be applied to Variety of Materials such as paper, Synthetic Leather,Plastic cards by Means of Heat and pressure. The Host surface can be Paper,Leather etc once applied cannot be removed ot transferred. We metalized the material by vacuum deposition of aluminum layer to make it scratch resisitant. 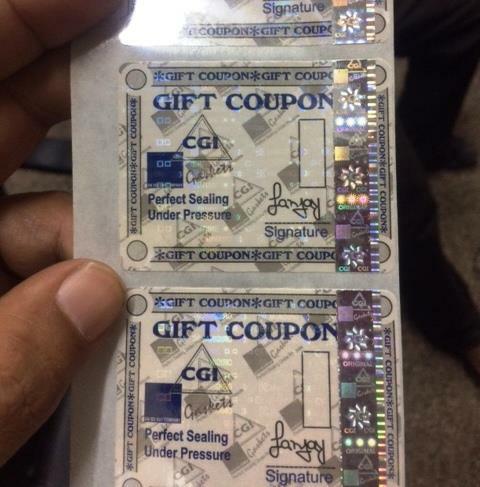 There three categories by which Security hot-stamping foil appled:-- a)	Registered Hologram Image with sensor Mark ---It has prominent Visual appeal to when incorporated to Product cost effective and not easy to remove once applied.We Put Single sensor on this High security hot-stamping foils to ease in its application by High speed automatic Stamping. 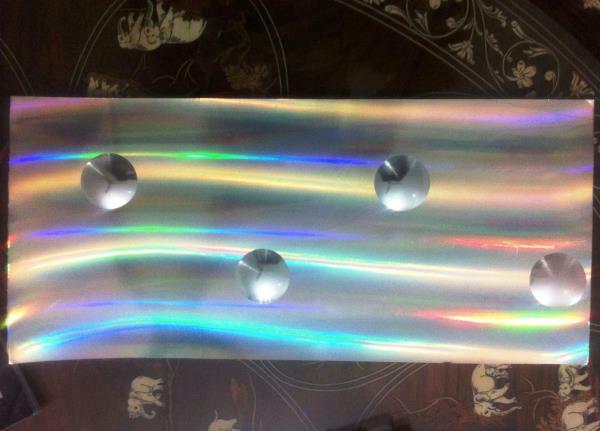 It has particular Holographic Pattern. a)	Un-Registered Hologram Image with sensor Mark:- It Has No Particular Holographic pattern or Holoimage . Can be be stamp easily due to its running pattern images.In this process waste will be less. b)	Registered Hologram Image with Both side sensor marks :- This solution is customized for different machine setups to make application easy and to speed the accuracy in operations. This film rolls has multi sensors around image for detection. 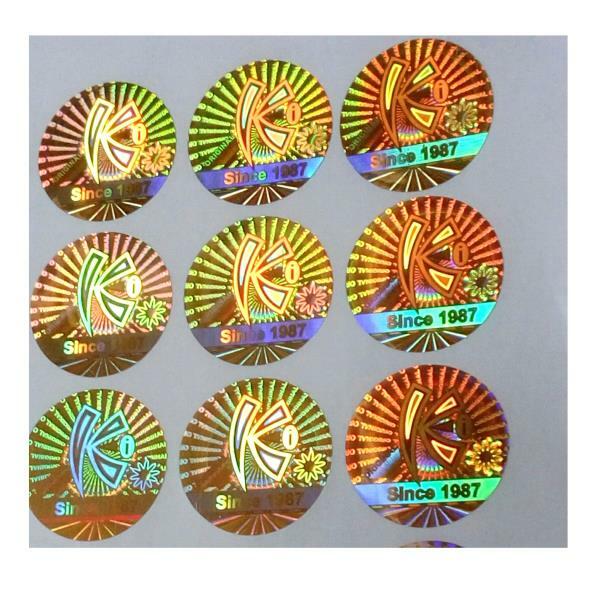 Transparent Holographic Id Overlays are patterned by making use of embossing of holographic pattern on Transparent HRI flim then we coat with glue typically 4/6 (40% flim/60% Hot-melt adhesive ) which is suitable for lamination on simple machine. Customized holographic pouches is available to achieve holographic security. It can be used on credit cards,Military Id cards and Luggage Tags etc. 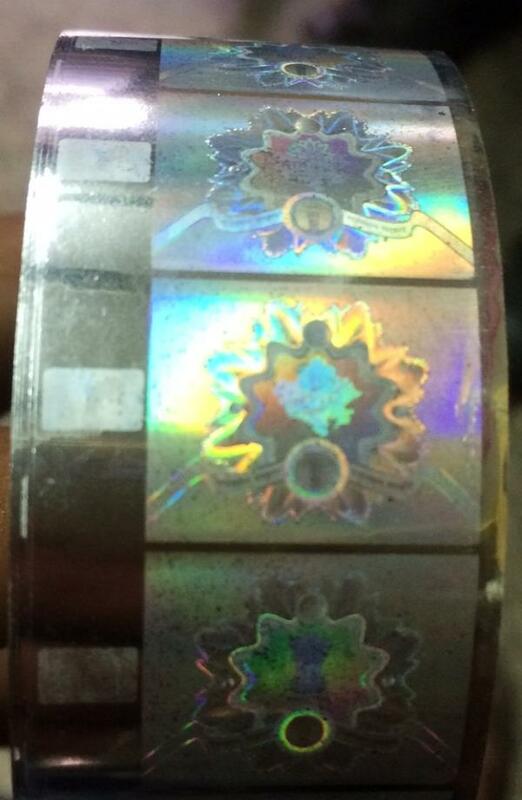 M/s Kiranholographics Manufacturer and exporter of Transparent Holographic Overlay Id Pouches and Rolls. These holographics Id overlays can be customized with any company logo gives two and three dimensional images on card. This can be done by various ways for small qty we offers General pattern Holographic ID overlays in Sticker form that can be easily affix on paper and plastic cards. 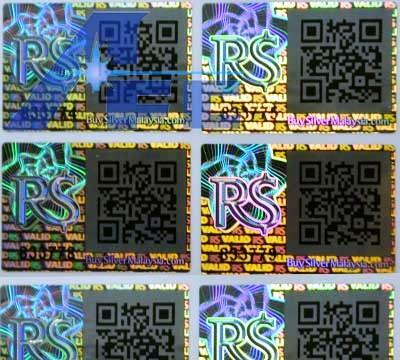 Another ways is to transfer through Holographic printer. We supply 23 micron transparent holographic flim for printer by which any can uses thousands of holographic patterns on card. E-beam Hologram developed by technology of the formation of micro relief originally developed for microelectronics.Electron Beam technology differ fundamentally from optical technologies because it uses electron beam, which can be very accurately focused with electromagnetic lenses. This e-beam technology can even achieve a resolution of 10 nm (0.01 micron). We can obtain e-beam holograms for Government of Rajasthan with special feature such as : High-resolution line patterns,Switch effect,Kinematic images,Concealed images,True color images,Micro-texts (25-150 micron),Nano-texts (~ 5 micron),CLR images (including dynamic and multilevel) to be controlled by special laser device,Images recorded by special shape pixels. Kiranholographics produce special forensic cryptograms—hidden diffraction images which can be identified only specialized Optical laboratories. Dot-matrix hologram has greater design flexibility then traditional forms of holography. Dot-matrix hologram consist of tiny dots or holopixels oriented at different angles and arranged in two dimensional array.Dot-matrix holograms are high brightness and resolution upto 3000 dots per Inches when white light falls on these holopixels it breaks up into spectrum of colours and redirect light at various angles and form a kinetic effect image. Dot-matrix hologram can be in corporate with hidden laser readable text, Holographic water marks, micro text ( as small as 12 micron in height) etc and many more security features. Hologram with 2 dimensional visibility. 2D Hologram is tamper evident and made up of two dimensional layers with hologram images visually place one behind another that will result into Three dimensional effect.2D Holograms has visual depth because each layer has different distance from our eyes. 2d holograms has shinning on its first layer. We use several software to develop 2d holograms such as corel draw to design artwork in which we separate artwork into 2-3 layers and fill different colours to provide more visual depth in 2d hologram. Kinemax hologram is latest hologram technology in which hologram image can be obtained with broad range of holographic effects such as Litographic mode (Low and mixed frequencies “White” holograms), Fresnel Lenses with any curvature,Fresnel prisims, 3D white embossed objects , Asymetric hidden images,convert laser images.Special feature is Embossed Metal effect with 256 angles x 256 color kinetic hologram. Water mark effect is possible with this system of master development Kinemax. Kiranholographics leading exporter and manufacture of security holograms in india can provide more high secure features with this technology. 3D illusion promotional hologram images are recreated from a scale model or live subject that produces real depth and clarity with stunning rainbow colour and gives ones brand product an esthetic looks. 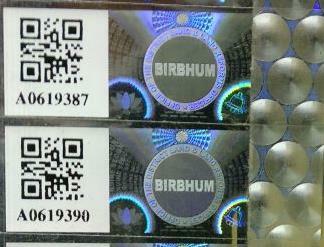 Many promotional holograms used for jewellery,wall hangings, key chains etc. Promotional holograms self appeal and attract attention of consumers. We can shoot any live 3D model hologram of any character it can be a cricketer or cartoon character. Highly recommended for brand promotion purposes and kiranholographics manufacturer very high quality real depth 3d holograms. 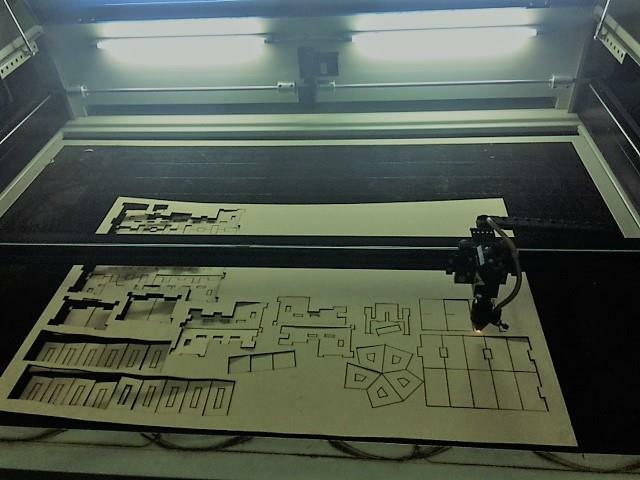 Co2 Laser cutting machines by Kiranholographics offers a wide variety of cutting and engraving options on different types of materials like acrylic, leather, wood, fabric ,plasticetc with high speed and accuracy. Cutting and engraving through laser is a non-contact process which makes the running and maintaining procedure quite easy. With a mere setting of power a single machine can perform both the cutting and engraving functions at the same time. 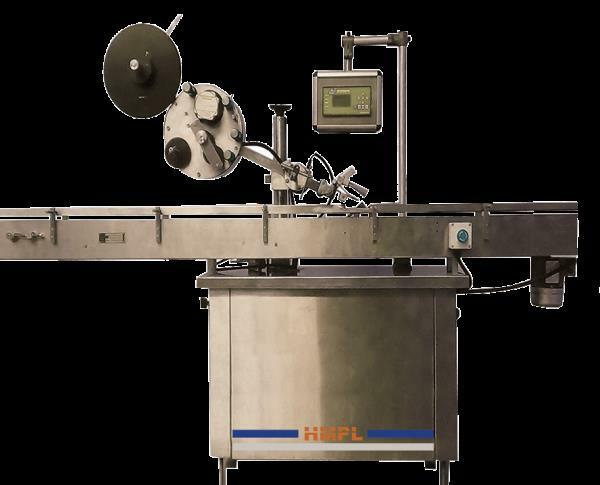 Here, we can provide you with single head and double head machines depending upon your requirement of production. Kiranholographics is owned Co2 Laser Cutting machine for Job work on all non-metal material. We customised all kind of products such as Laser cutting Jaali,Name Plates, Puzzles,Decorative products. All kind of jobs for Laser cutting Jaipur (India). 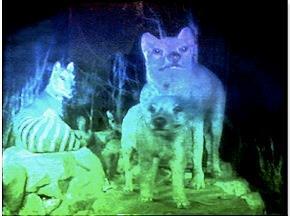 Digital holograms are a series of computer-generated images in sequential order and these images do not require to record the light distribution of the objects, unlike optical holograms. The research work of digital holograms is mainly inclined towards formation and rendering of images. It is possible to reconstruct the imaginary objects that do not exist physically in digital holography. Digital holograms are initially saved as a file directly and using a computer program they are reconstructed. They are simpler to record and reconstruct, but resolution is much lower than a holographic film. 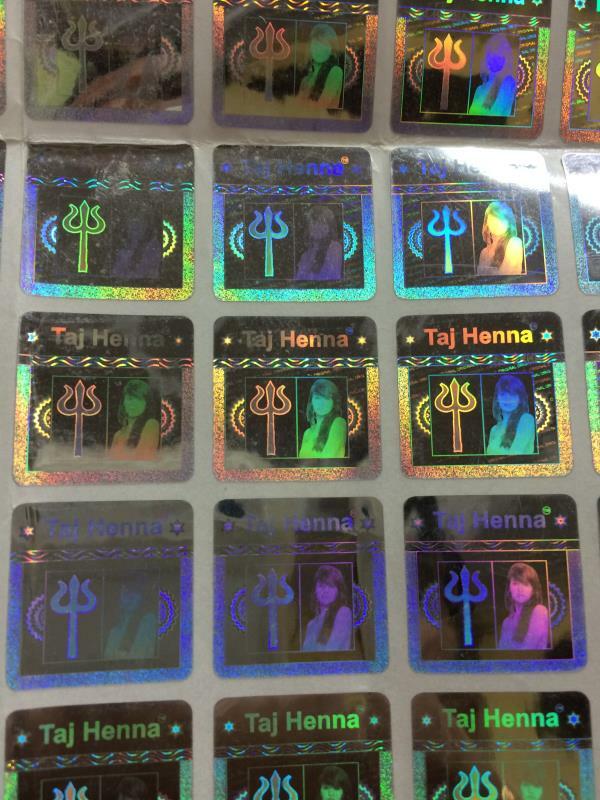 Digital Hologram sticker Manufacturer in India. The content for digital holograms can easily be produced by non-experts, and the printing process is comparatively inexpensive. Usually a three-dimensional graphical scene, a series of digital photographs or a short movie of a real object is enough for producing digital holograms. 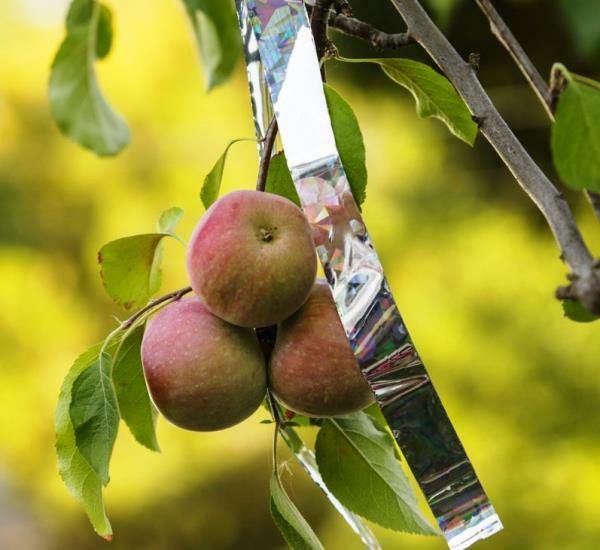 We are Leading Exporter, Importer, Distributor and Supplier of Holographicwide web film in both PET and BOPP.Holographic Wide Web Films provide 100% security to the products against the threat of counterfeiting and duplicity by making them completely secure. Holographic Fresnel Lens Lamination Film are specially designed and manufactured using premium quality raw material and sophisticated printing technology for extensive utilization in packaging industry.It’s combats the risk of duplicity & increases the aesthetics of products.This is very useful for flexible packaging,lamination, printing, labels and gift wrappings etc. Lens films are currently used for cosmetic packaging and beverage cartons, as well as video games and recent blockbuster DVD releases, Liquor Bottles cartoons. These specialty films are created from Linear and Circular Fresnel lenses. A Fresnel lens is a microstructure made of facets that bend or reflect light like a thick lens . They can be made to either focus or spread light. These lenses are originated in our Diamond Turning Machine (DTM) Lab using a diamond tool to cut facets into a metal mold. We have created a variety of stock lens patterns that are innovative in their active motion and 3D depth. A new holographic feature called COMPASS. The combination of holography with a holoQR and compass is opening up new potential as an anti-counterfeit system for documents and products. One application is for smart labels, specifically an Internet of Things label (IoT) that combines anti-counterfeit holographic and other technologies with mobile authentication within a single product. The label can be used for a variety of consumer goods applications as well as legal and identity documents, providing at a glance important product information: nutritional or content information, use by date, manufacturer/distributor/supplier information, health warnings and safety data alongside compliance and contact details. It can also link to mobile devices as part of a brand loyalty programme, facilitating customer feedback and interaction and accommodating product and service updates., or offer instant verification and authentication of product or document originality via a mobile phone. In today,s Market Paper labels with holographic strip is in demand because of cost effectiveness and no additional labor is used to affix hologram manually our clients are very much satisfy with this development. 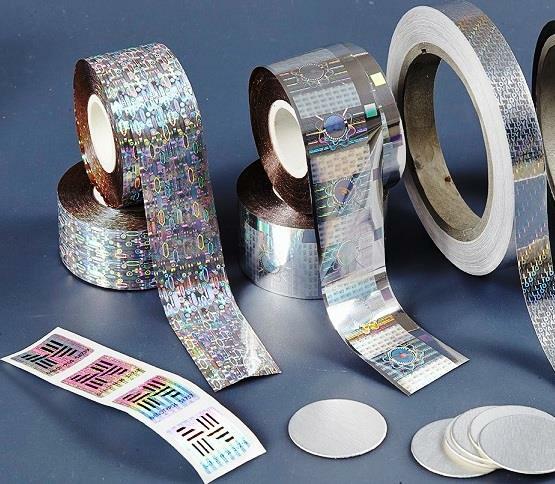 It is utilized for packaging different industrial products majorally in spare parts industry and pharmaceutical companies for there product security and data on paper label and hologram strip will gives additional security. We design these strips in roll forms by using optimum grade materials and sophisticated printing techniques to make it suitably applicable on PET, BOPP, paper, aluminum, LDPE, HDPE and PVC materials. 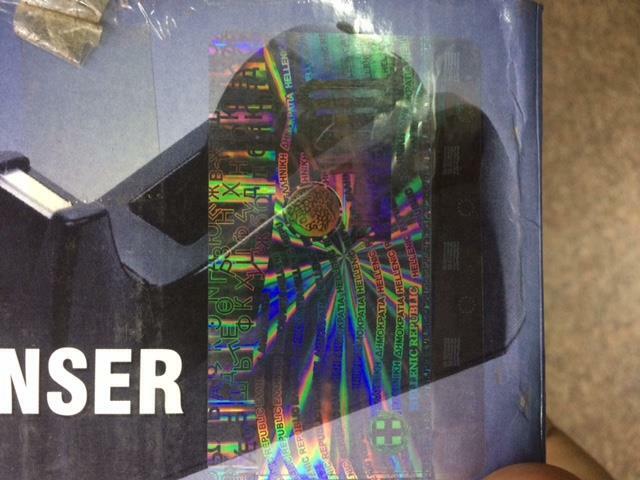 The holographic image can be transferred on the product by employing a specially designed machine to avoid counterfeit of the products and brands. These shrink sleeves are Hollow tube of clear PVC Flim in which we transfer holographic strip inside the sleeve to ensure that the hologram are damaged when seal is broken. This is to avoid the Possibility of adulteration of opening bottle caps .It is impossible to open the bottle without destroying the Hologram. Shrink sleeves can be applied on customized multi-colour roto printing pvc films.The application ccan be manually and by automatic applicators.